The track was originally opened by Jeffrey Archer and Councillor Sydney Harding on 28th April 1985. It had became in need of resurfacing and the runway outside the back straight was resurfaced in 2001. On 29th April 2002, following a lottery award, work started on a complete revamp of the track. This involved resurfacing, moving the internal LJ/TJ/PV runways, providing floodlights and a security fence. The track reopened with a meeting on 26th August 2002. Click here to see a diagram of the old track. Until about 2000, the covered stand used to have a capacity of 90 but the seats have been moved out and placed alongside the stand. 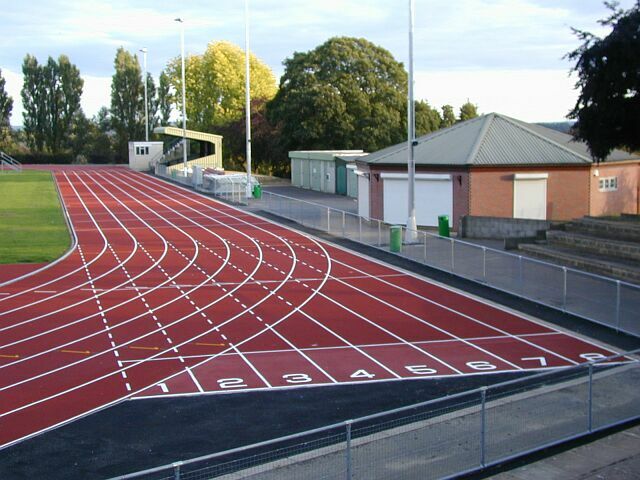 Yeovil Olympiads AC have their clubhouse at the track which opened in 1988 and is called the Joanna France Memorial Clubhouse. The entrance to the track is from the cul-de-sac Pickett Lane which is a turning off the A37 about a mile north of the town centre. It is also accessible from Chilton Grove (a turning off the A359 Mudford Road) which is the main entrance to the Yeovil Recreation Centre which is basically a large area of grass pitches.